There are several levels or stratus of testing that should be considered. The first level is basic functionality i.e., “does the storage device work at a functional level“? Can it write and read without getting any errors? The next level to consider is performance, i.e. “does the storage device maintain a minimum data transfer rate? At this level test results can start to become dependent upon the data pattern used for testing. For example, testing a tape device that does data compression using a repeating highly compressible data pattern can lead you to false assumptions regarding transfer rates and amount of tape media used. Or testing using large records when the real-world target application transfers small data sets may not be optimal. For this reason consideration should be given to the data pattern used during testing. Ideally you would want to test using a data pattern that closely approximates the type of data that will be stored on the data storage system in its “real-world” setting. Most standard test tools will provide a number of different data patterns, usually either random data or various types of repeating data, such as alternating 1/0, incrementing byte, and so forth. How do these patterns relate to real-world data? The answer is they may not relate well at all, therefore another source of data patterns should be available. Being able to load a user-defined data set for testing is very important, as is having a selection of data files which closely represents real-world types of data. To provide a number of data sets that closely approximate real-world data we will turn to a sample of data file sets which has been developed specifically for testing new data compression algorithms. The files were selected based on their ability to provide representative performance results. These files were originally compiled to be used as a standard data set for testing and measuring data compression methods – they also work perfectly in our application as real-world data patterns that closely mimic real-world user data such as spread sheets, database, text, binary executables, and other types of data. These files are used by Disk Manufacturing Module (DMM) to scrub/sanitize disks. DiskErase-Speedy.seq – this test does one complete overwrite of every block on the drive, using a random data pattern. A. MODE pages are used to define the behavior of a device, and LOG pages are used to report the behavior of a device. Both MODE pages and LOG pages are used on SCSI, SAS, and FC drives, but they are not present on ATA or SATA drives. 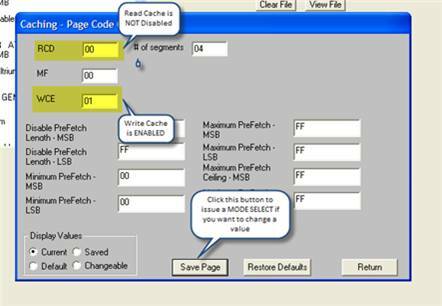 As an example of a MODE page let’s look at MODE page 8, the CACHING MODE PAGE. We issue a MODE SENSE command to read a MODE PAGE. This command will return data that is defined in the SCSI specifications found at www.t10.org. In the case of the CACHING page we can see how the drive is configured as far as caching read and write data. We can change these settings and write them back out to the drive by using the MODE SELECT command. In STB select a disk drive, then right-click and choose the Edit Mode Pages choice. Then choose the page you are interested in from the menu and click Edit Page. LOG PAGES, on the other hand, record various performance metrics as the drive is used. Select a drive again, right click and choose View Log Pages. 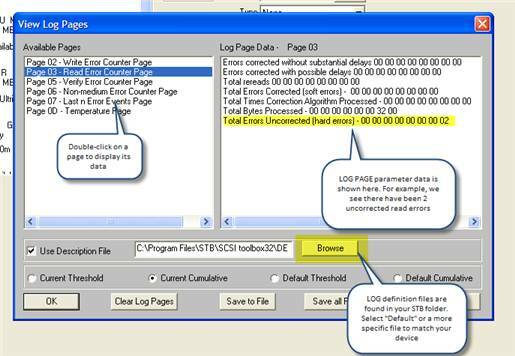 Be sure to click on the Browse button to select a LOG PAGE definition file so interpret the log information for you. We have made available a new series of Disk and Tape Manufacturing scripts that can be easily utilized in our DMM and TMM modules. All of these are available for download immediately and will be included in the 7.2 release coming April 15th, 2008. Coming in the April 15th release of the SCSItoolbox Suite, DMM (Disk Manufacturing Module) will support read/write percentages. Active Performa customers will receive this upgrade automatically. If you’re Performa coverage has lapsed, please Contact sales to upgrade your STB Suite today!